The very first gaming performance face-off between the AMD Ryzen 7 1800X and the Intel Core i7 6900K is here. Both processors were put in a head-to-head comparison running the same game, the same in-game scenery and at the same time. 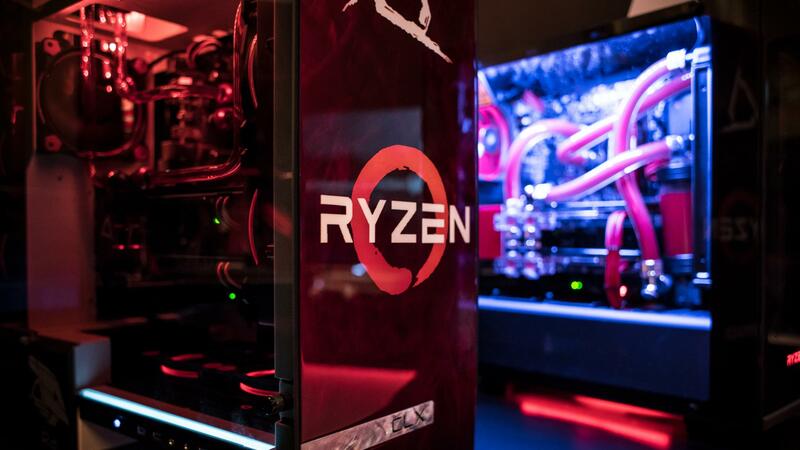 This side by side comparison is courtesy of PCWorld and it gives us a taste of what to expect from the Ryzen 7 1800X in games. The Ryzen 7 1800X is an 8-core 16-thread CPU based on AMD’s brand new Zen microarchitecture. The chip has a base clock of 3.6GHz and a boost clock of 4.0GHz. The Intel Core i7 6900K is also an 8-core 16-thread processor, based on Intel’s Broadwell microarchitecture. The CPU has a base clock of 3.2GHz and a maximum Turbo speed of 4.0GHz. It also happens to be the fastest 8-core desktop CPU on the market. That is until the Ryzen 7 1800X comes out on March 2nd to contest it for that spot. AMD has already claimed the fastest 8-core crown for its 1800X after demonstrating a 9% performance lead in Cinebench R15 at its Ryzen press event. Do we have a new 8-core king on our hands? We’ll only find out definitively on March 2nd. However, today we get one step closer to answering that question with this gaming test. For this comparison both systems were identically spec’ed with dual RX 480s in CrossFire and 16GB of DDR4 memory. 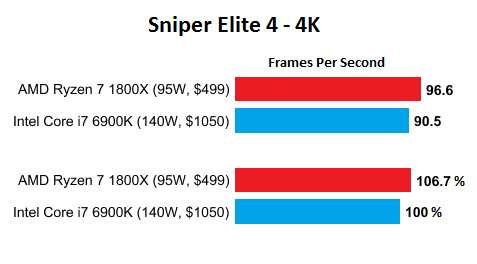 The game in question is the recently launched Sniper Elite 4 running at 4K. To make sure the test is as empirical and accurate as possible, PCWorld’s Jarred Walton positioned the character and the camera in the exact same position on both systems. To ensure that both systems were rendering the exact same scene. The Intel core i7 6900K manages to average 90.5 frames a second. Rendering the exact same scene, the Ryzen 7 1800X manages to push over 95 FPS and averages 96.6 frames a second. This amounts to a 6.7% performance lead. Which doesn’t necessarily seem all that significant, until we realize that the 6900K is a 1050 dollar chip while the 1800X costs less than half that at $500. The value proposition that Ryzen represents is very significant for gamers. Because each dollar you save on your CPU purchase you can put towards a higher-end GPU or an additional GPU. Which would have a much more considerable impact on gaming performance and the overall gaming experience.